Just thought I should post a note saying that I am heading to my Mom's for the next 9 days and will be very busy, so my blog may not get updated. 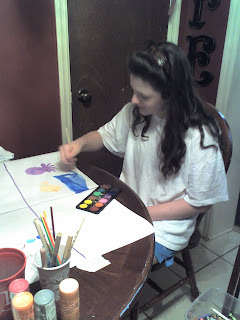 Oh, it is gonna be so great..........Rissa's birthday falls a few days after Moms, so we are having a cookout for her with a Hannah theme of course. Following her Hannah sighting this week on the same beach as Mom lives, what else could be more appropriate? Then we are rolling right into 4th of July, with a low country boil and fireworks on the beach. I am looking forward to this time so much! Somehow things seem different. For a few years, it seemed like my sister and I lived on different planets. Being almost 16 years apart in age hasn't helped, nor has living halfway around the world from each other for a good 10 years. Now, however, we talk almost every other day or so and email constantly. I cannot wait to see her today and spend this whole week with her. I love my sister very much and I hope this week turns out fabulously for all of us! I will post pictures of the two of us if I can get someone else to hold the camera. Bad thing is, my sister and I are the photobugs in our family! SHRIEK! SQUEAL! SHRIEK! SQUEAL! SHRIEK! Later than evening, we managed to get some info out of a security guard and we hung out in just the right place to be less than 6 feet from Miss Miley herself! And while she did not stop for any autographs, she was close enough to us that Riss got her star fix! She was truly beautiful, and seemed very happy. Ok it is killing me that I still can't upload pics from my camera. All 3 memory cards are full. Jamie thinks he may have accidentally put the cord for my camera in his laptop bag, which of course is with him on the boat. He will be home tomorrow morning and we will solve the mystery. (Or buy a new cord and/or card reader.) In a pinch, my camera on my trusty phone works ok. 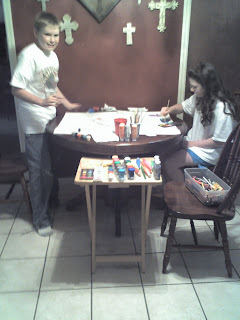 Here are some pics of Riss and Zack working on project number 3,972 at my kitchen table. 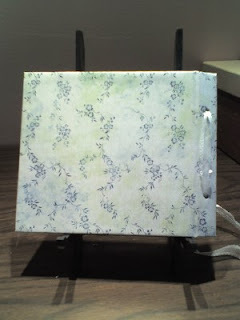 And I worked on a little project of my own, a guest book for my Mom's upcoming 75th birthday party. I cut all the pages to go inside....emphasis on "cut", as in, I made them the wrong size. 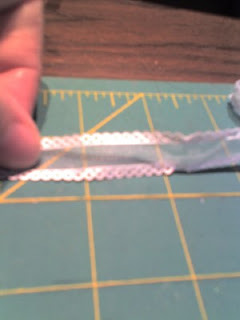 of course, that was the last of my white cardstock. So, tomorrow, I buy cardstock and complete the book. We are leaving the pages blank, with no lines, so people can sign in and maybe write a personal message to her or whatever. 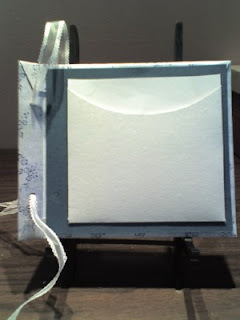 There is a pocket inside the back cover for a CD of photos, pressed flowers, birthday napkin, or whatever she wants to put inside. Ah....summer. It has been so hot here! It is hard to believe it is just mid-June, and it is so unbearably hot already. This weekend it is supposed to be 101........way too hot for me! The great thing about hot weather is that water cools you off so quickly. Jamie finally talked me into buying a slip and slide for Marissa while her cousin Zachary is visiting. Everything inside of me screamed "NO!!!!!!!!!!!!!!!!!!" since Riss has had 5 broken bones in her short life and somehow throwing yourself onto a slippery surface on the hard ground just didn't make good sense to me in light of that, but I caved. Looks like one reason he wanted her to have one so bad is so he could play too! It's finally over! Goodbye sixth grade! We are so proud of her for finishing the year with such an outstanding performance! Watch out 7th grade...here we come! Now that I finally have time to post and something to post about, I CAN NOT FIND MY CAMERA CORD TO UPLOAD PICTURES!!!!!!!!!!!!!!!!!!!! Tried to put it in the reader slot on her computer, then save to flash drive. Small problem. Her desktop has no card reader slot. Thought about putting them on Jamie's laptop. Small problem. He has the laptop with him on the tugboat. Sorry it has been so long since I posted last. The day after we came home from Columbia I got very sick with a sinus/bronchitis thing and I am still not over it 100%. Things have been so hectic and crazy around here lately that I think my resistance was really low, so when this bug caught me it hung out for a while. My lungs are still not clear and feel very heavy at times, so we are watching that. I am trying to get extra rest but this time of year that is almost an impossibility. Marissa is almost finished with 6th grade. Just 6 more days! She had her band recital Monday night and did well. She has stayed after school a few days to earn some extra credit in band (to earn the pretty little stars on her uniform sleeve)and now is staying after for Spanish dance lessons. Add the regular after school clarinet lesson with Caitlin and she has been one busy young lady! We got the last of the projects turned in, the space station model and planetary display went last week and the project on Nicaragua (done fully in Spanish mind you) went in this week. She is turning in textbooks gradually and got her yearbook this week too! The new scrapbook store in Pooler is set to open next week. I will be teaching some classes there including the Scrapbook 101 beginner class and hopefully some others soon about saving money when scrapbooking, using sketches in scrapbooking, and other themes. 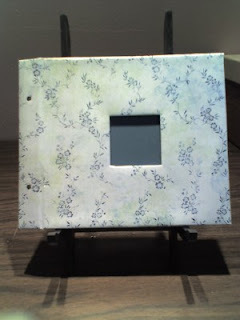 Check out the new store at www.scrapbookstudiopooler.com Cecile is doing a great job of getting some FABULOUS product in and I am excited to get my hands on it!!!! Kathy's grandson Zachary is here for a month long visit. It is different having a boy in the house! He and Riss play together really well, in fact yesterday they had a water balloon fight in the front yard and them bobbed for apples. Yep, you read that right. Bobbed for apples in a bin of water in June. I am really looking forward to the last week of the month, when we will be at my Mom's house celebrating her 75th birthday! My sister and her family will be here form Baton Rouge and it will be a great time! Can't wait to see my nieces and spend some time with them. They are both so busy in nursing school and medical school at LSU that we have to squeeze in time together when we can! One last thing, did you see the thing on the news about the woman who delivered her baby in a Springfield (I assume Illinois) motel room and left it, cord still attached, on the bed with beer cans? Luckily someone heard the baby cry and found it before anything worse happened! The last news I heard was that the baby was being cared for in a local hospital and they were trying to find the mother, who is facing charges for her stupidity. How can someone just abandon a newborn like that? People have options....there is no excuse. Recent legislation makes it possible for women to leave babies at fire stations and hospitals and avoid charges of abandonment, child endangerment or whatever, and there are so many people who want to adopt, I just don't understand how someone can be so cruel. I am just glad someone heard the baby and took action. It is good that some people are not afraid to get involved!!!! Thanks for sticking with me and I hope you have a great day!